Explanation: Planetary nebulae are strange. First, they are gas clouds and have nothing to do with our Solar System's planets. Next, although hundreds of planetary nebulae have been catalogued and thousands surely exist in our Galaxy, aspects of the formation process are still debated. 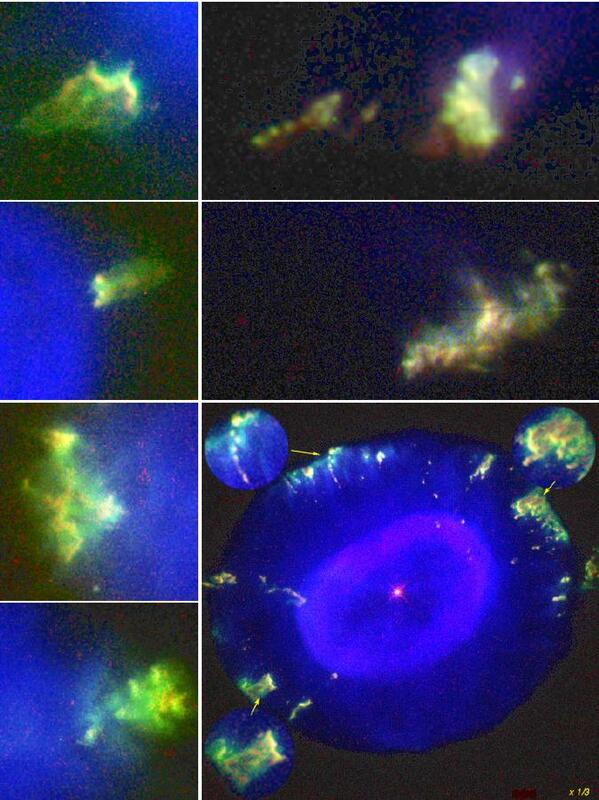 But now yet another mystery has come to light: what created the fast-moving gas clouds that appear around planetary nebula? Dubbed FLIERs for Fast Low-Ionization Emission Regions, these knots of dense gas appear to have been ejected from the central star before it cast of the planetary nebula. Currently, no model can account for either their formation or longevity. In the above false-color picture of NGC 7662, the Blue Snowball Planetary Nebula, the FLIERs are featured in the image inserts.